Low-dose CT lung cancer screenings are growing in popularity, with hundreds (if not thousands) of hospitals in the consideration or initial stages of program implementation. National trials and program innovators have proved the potential to save lives and boost CT exam volume and department revenue. 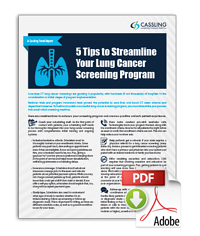 To build and sustain a successful lung cancer screening program, you must streamline your process into a well-oiled screening machine.